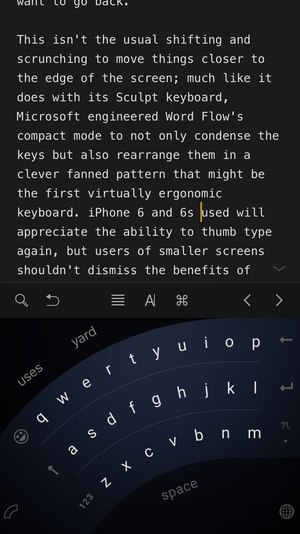 Alternative keyboard for iPhone has a helpful one-handed mode and support for swipe typing. Word Flow sports a familiar layout. For a company that mostly relies on other hardware manufacturers, Microsoft sure knows its way around a keyboard. From the Sculpt’s funky ergonomic design to the elegant and innovative Type Cover, some of the finest keyboards are adorned not with looped squares but with Windows logos, and many iMac users are more than happy to swap out Apple’s for one of Microsoft’s. 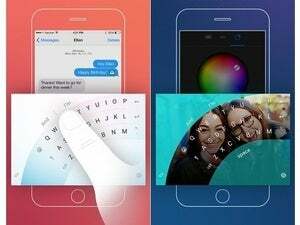 But with the release of its Windows Phone keyboard for iOS, a whole lot of iPhone users might be dumping Apple’s keyboard, too. A modern rethinking of mobile typing that takes advantage of the flexibility and elasticity of the soft keyboard, Word Flow (free on the iTunes Store) takes Microsoft’s expertise with hardware and applies it to the virtual space, creating what might be the first keyboard that’s downright pleasurable to use. Word Flow has its own style, but there’s nothing too radically different it, at least not in its default mode. Letters aren’t boxed like they are on Apple’s offering, but otherwise it’s quite similar, with a familiar placement for emoji and other special characters, and the same trio of word choices that change as you type. While Microsoft’s prediction and auto-correct suggestions are about as good as Apple’s, the lack of a way to hide the bar cuts down on some of the available space. 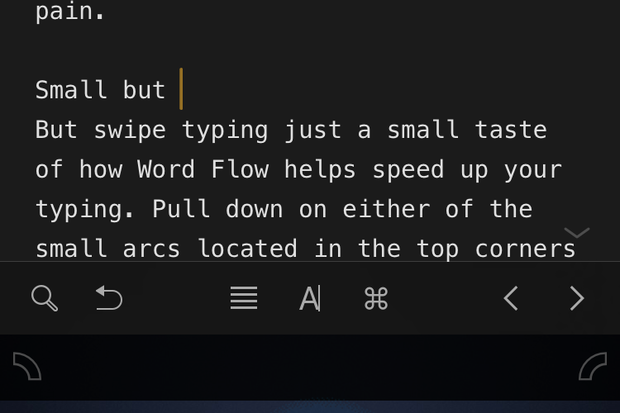 There’s a cool animation that lights up the keys as your fingers tap them while typing normally, but most people will choose to use to use Word Flow’s top-notch swipe system. It’s rare to find a non-Swype keyboard the does gesture typing well, but Microsoft has nailed it, with an intelligent system that understands double letters, proper names and compound words. Despite animated letters, however, the unclear shift key makes capitalizing a bit of a pain. 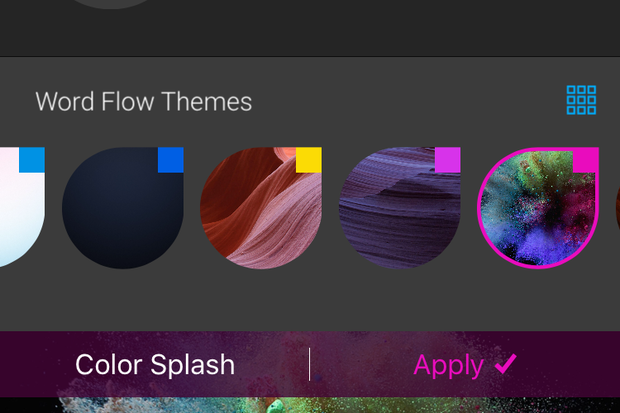 Customize Word Flow with a theme. 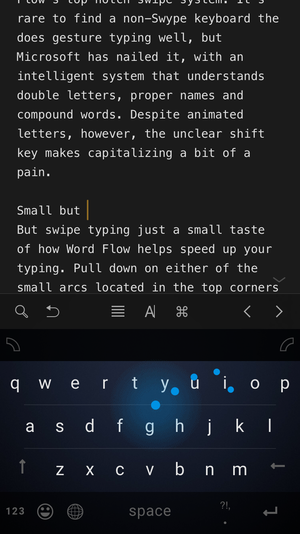 But swipe typing is just a small taste of how Word Flow helps speed up your typing. 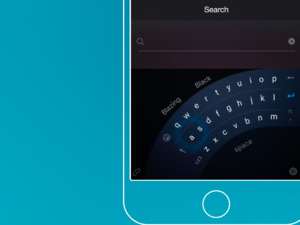 Pull down on either of the small arcs located in the top corners and it will shift into the appropriate one-handed mode, revealing a unique curved set of keys designed to make an iPhone 6s Plus as easy to use as an iPhone SE. There’s a bit of a muscle memory adjustment for sure, but once you get acclimated to the layout, it’s unlikely you’ll want to go back. This isn’t the usual shifting and scrunching to move things closer to the edge of the screen; much like it does with its Sculpt keyboard, Microsoft engineered Word Flow’s compact mode to not only condense the keys but also rearrange them in a clever fanned pattern that might be the first virtually ergonomic keyboard. 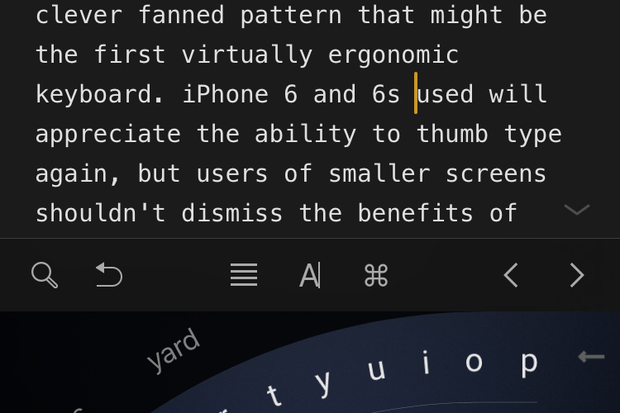 iPhone 6 and 6s users will appreciate the ability to thumb type again, but users of smaller screens shouldn’t dismiss the benefits of Word Flow’s one-handed mode. 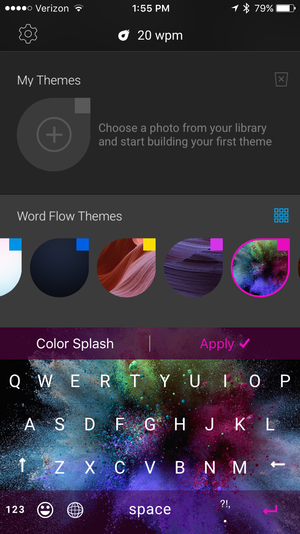 The keyboard can be customized with one of several colorful themes or a picture of your choosing, but the auto-detecting dark/light mode will suffice for most. Besides, Word Flow is designed so well, spending a lot of time looking at it really isn’t the point. 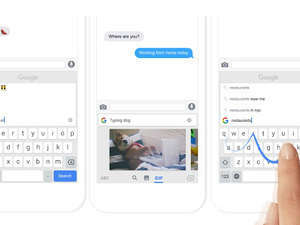 Microsoft’s first iOS keyboard simply makes it easier to type, whether you’re using one hand or two.